I think one of the things that has made this pregnancy feel so different from my last two is that my heart and hands are so much more full, with two little ones to care for already. Trying to take care of the needs of my children, my husband, and my home (not to mention, participating in other relationships, church fellowship, and maintaining my blog and completing an ebook) just has me so occupied that I find pregnancy sometimes get relegated to the back of my mind, strange as that may seem. The person in the house who is probably the most excited about and continually talking about the new baby is actually Abbie! She loves to pray for our new baby, to kiss my belly, to pour me glasses of water "to keep our baby healthy" and just to remind me of the precious gift coming our way! I am starting to become more aware, though, and increasingly excited, now that I am feeling well most days and starting to regain more of my energy. I've felt the first few teensy, fluttery movements and I know that as they increase in intensity and frequency, I will have a wonderful and constant reminder of this sweet new person that we will be meeting in about 5 1/2 months! I do definitely have a belly and am starting to show obviously to others. I took advantage of some Christmas and birthday money (thanks Nana!) and all the after-Christmas sales to stock up on some shirts that have worked well for the transitional time before I move into maternity clothes. There are many styles right now with empire waists or that are simply loose enough to accommodate a still-small but expanding belly for a little while (and will fit again after baby is born). For bottoms, I've been wearing the small selection of "larger" pants that I keep set aside for the early months and also for after baby comes, although just this week I am finding that these aren't cutting it anymore either (even with elastic bands), so I've just pulled out all of my true maternity pants. Sigh… 🙂 Guess that's how it goes with baby #3! I've had a couple of appointments with my dear midwife, Anne. She delivered both of our other children, and feels like a family friend. It's always a blessing to spend a little while with her, just talking over concerns, getting suggestions, and just recently, hearing the baby's heartbeat! We are preparing for another homebirth, and I am really looking forward to it, August heat and all! Now that I am able to eat and cook more freely, I've been working hard to add in many more fresh fruits and veggies to my diet (fiber! ), to keep up with my Cod Liver Oil, B vitamins and Calcium/Magnesium supps, and to increase my protein and iron consumption (I loosely follow the Bradley method and aim for 80-100 grams of protein per day). My appetite is increasing, though the heartburn still attacks from time to time, and I am trying to make every bite count, nutritionally speaking. My main complaint right now would be the fatigue that I can't quite kick. I've had several Vitamin B shots in the past few weeks, and those have really made a difference, in my nausea and heartburn as well as in my energy levels. However, it doesn't feel like quite enough. I'm planning to try to up the iron in my diet, as well as add in an iron supplement for a month or two, and see if that does the trick to deal with this fatigue (my iron supplement of choice is Floradix liquid iron, which I am going out to buy today- yay!). And that's about it- I wish I could tell you about the plans I have to start preparing for baby, but right now I'm still working hard to get back on track with my cooking and cleaning and just getting through the day without needing a nap! 🙂 Really, no matter how tired I am or whether I'm struggling to accomplish all that's on my to-do list, I feel so blessed to be pregnant and so thankful for this new addition to our family! Any other pregnant mamas out there? 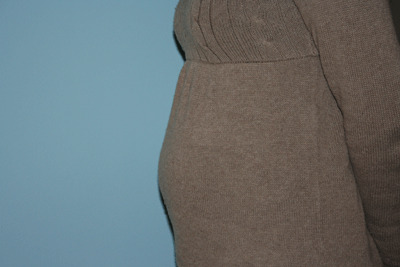 Where are you at in your pregnancies and how are they going so far? Previous Post: « Spring gardening, here we come! Trying, waiting, praying, hoping for a child. Living as healthy as we know how! God is good. I am due next week! Feeling tired and slowing down a good bit, trying to keep up with my 3 active children, but I have been very blessed not to have any health problems. I’m so excited to meet this little one! I’m at 30 weeks, so I’m slightly ahead of you. 🙂 How well I remember the tiredness in the first trimester… and now again occasionally as the clock ticks down. You’re doing a lot of work to be building a whole human, so my best advice is to not feel bad about letting some things go. My belly looks like yours! 🙂 I’ve been sewing maternity skirts with stretchy tummies. My favorite so far is a “tie-dye” batik print one. I’m at the beginning! Honestly, I don’t know how far along I am. I’m still nursing my 1st, who turns 1 in two weeks!, and never got my cycle. So I don’t have much to go on other than when I started feeling like I was pregnant and took the test! I’m guessing maybe 6-8 weeks, but not sure. I’m hoping that my midwife can get a better estimate by measuring an ultrasound picture! I guess I need to call for my 1st appt. soon. I am so envious of your little baby belly! Last month my doctor tried to tell me that since I was measuring so small and he couldn’t find a heartbeat, I was wrong in my dates by over 9 weeks! He then tested my blood hormone levels to determine how far along I was only to discover that my levels were consistent with only 6 weeks of pregnancy and decreasing (I was supposed to be 15 weeks at that point.) He told us that the only explanation was a “non-viable fetus” that was in the process of miscarrying and wanted to perform a D&C. Thankfully we insisted upon an ultrasound first because when we had it they found a perfectly healthy, normally developed, very active, 15 week old baby girl. Needless to say, are incredibly grateful for God’s mercy and are very excited about the arrival of this little blessing! I am 17 weeks pregnant! Due July 26th! This will be our 5th baby and we are planning a homebirth too 🙂 Our last child was born at home (a waterbirth) and now I can’t imagine doing it any other way. I have just moved into maternity pants too 🙂 And some tops…Goodwill had a sale on Monday with EVERYTHING 50% off…I found some great maternity jeans, capris, and tops!! I started taking Floradix this past week and am feeling better (I was struggling with dizziness/lightheadedness) and am taking New Chapter Prenatals and Nordic Naturals Prenatal Fish Oil. Also drinking a packet of Raspberry Emergen-C daily and some Traditional Medicinals Organic Pregnancy Tea. I’m in my third pregnancy also, so I know what you mean about being distracted from the pregnancy by the needs of two little ones, a husband, and a home! I am just about 24 weeks along now and feeling well, other than occasional days of pain from varicose veins. Since we have two boys and this one looks to be a girl, I purchased girls’ clothing for the first time today (from the Target clearance rack). It was fun to get something pink, and made me realize a little bit more that I really will be holding a new baby soon! i’m 17 wks and my belly is just huge!! 🙂 i feel like i’ve been in maternity wear for ages. oh well!!! i’m extremely tired still, and kind of waiting for 2nd tri energy to come back!! i love your wee baby bump! I’m 11 weeks today with baby #2, starting to feel a little better a little earlier each day. Fatigue was a huge issue, but the doc adjusted my thyroid meds and I can tell a big difference. Nausea comes and goes, big difference this time is that I occasionally have it at night too. I’m looking forward to lots of projects once I hit that 2nd trimester energy burst, like potty training #1, and moving him into a Full sized bed. We’ll be needing the crib! Have your tried liquid chlorophyll? I think it is the most frugal option for boosting your iron in supplement form. It has greatly helped me! I also second the Emergen-C as a good way to boost your energy! Blessings upon your cute growing baby belly! Are you guys going to find out the gender? Emily Kay, I would imagine you are ready to have that baby. I am sorry you are feeling so naseous.I have been blessed with this pregnancy.It has not been bad until recently and that is just exhaustion. My doctor things this baby is going to be much bigger than dd, she was 8lbs 10 oz! We have an old two story house and I just gate us off so I am not chasing up and down stairs and all around the house, literally! I’m 19 weeks tomorrow! I’m actually feeling pretty good lately although I still get winded and tired easily. The nausea is gone and I feel like a human again so that’s nice! I have a 7 year old and this is number 2. I absolutely love feeling this one move and kick…such a blessing! Oh, and we find out in 13 days what we’re having!!!! I will be 24 weeks tomorrow with baby girl #2. I found that the nausea was much worse this time around, but my energy level so far has been much better. I think it is simply because with a toddler around I’m forced to be more active. I’m a high-risk patient due to some blood-clotting issues, so there’s always a worry in the back of my mind, but so far all looks good. It was fun to read your update as I am due August 10th. A few days behind you. I am only beginning to eat better after all day sickness, but I waiting for my energy to return. This is my third pregnancy, but will be my first home birth. I am excited and nervous about home birth at the same time. I will have to check your site for home birth info. My tummy is starting to grow, much earlier than with my first two, but my 3 year old is excited much as your daughter is. Last night I felt a flutter for the first time. What a blessing. I’m 12 1/2 weeks and still very sick. I seem to have a good day, and then a bad day, but it is getting better. I sure hope the energy picks up soon, and the vomiting stops. Just starting to show really and have grown out of my pants. I’ve been following your blog, and it is encouraging listening to someone just ahead of where you are. I can’t imagine how people make it through the sickness with other children! I’m in awe. What a fun post! I didn’t realize we were about the same amount along. I am due August 9th. I just started reading, and I LOVE your blog so far! So many great ideas! I have no visible bump, and since I lost about 15 pounds since getting pregnant, I’m still easily in my regular clothes. But I’m overweight to begin with, so that all is to be expected. I think I’ve been feeling little flutters and bumps, but still not sure if I’m imagining it. Can definitely feel the little bump with my hands though! I love your pregnancy posts – please keep them up! PS We are planning a homebirth too! Stefanie, just to encourage you- I find that around weeks 11-13 (for me, anyways), instead of being constant, the sickness starts to come and go. Gradually, it will go less than it comes. 🙂 Hang in there! One day soon, you’ll realize that you feel good again! Love hearing all of your updates! So much fun- thanks for sharing! Love the bump Stephanie! I’m 27 weeks with number one, and love hearing about how your daughter is already nurturing your little one – makes me feel excited about having more already! We are also planning on having a homebirth. This is the first time I’ve read your blog, recommended by a friend. Your topic on pregnacy 16 weeks got my attention. God has blessed me with four wonderful children whom I delight in and 5 heavenly children whom I also take delight in though I miss them terribly growing within me and tapping on my tummy. I start feeling baby nudges at 15 weeks. However, between 16 and 18 weeks we have lost four little ones. Recently,one at 18 weeks, this past September and one at 16 weeks this past month. Our two tiny baby girls join their two brothers and another little one in heaven. I guess this is why your post 16 weeks caught my eye. I enjoyed reading the comments of all the excited mommies. I would encourage you all to enjoy each day of your pregnacy and be thankful for each day that God gives you with your little one. May God give us all strength to be joyful mamas when we are feeling sick, oh so tired, are behind on the chores and not sure what is going to be for dinner. These are little things when considering the big picture. God is working a miracle in you and has given you reason to rejoice in Him. After our third loss God gave us a healthy little girl now 21 months. She has been an amazing blessing to our family. She still tells mama that there is a baby in my tummy. Oh, so hard! We are hopeful that the Lord will bless us again and are trusting in His promises. You can read more about my story on my website. Thank you for your post! Just a tip to get a little more iron into your diet. Use an iron skillet when cooking. Food actually absorbs a little of the iron from the pan.